Another DragonCon is in the books. This was my third year going and it was, as always, a blast. An exhausting blast, but still a blast. Here are some random thoughts on the convention. It strikes me that there isn't really a DragonCon so much as there are multiple DragonCons running concurrently. Total attendance at the convention is somewhere north of 80,000 people. The sheer number of folks who attend paired with the fact that it takes place in multiple hotels, plus the fact that there are multiple fandoms represented (literature, film, television, anime, gaming, comics, etc.) means that one attendee will have a very different experience than another. The first year I attended, I was excited about all the craziness: the cool stuff in the vendor halls, the creative cosplay, the general madness. Three years in, that stuff has become less interesting, even annoying at times. (See: waiting half an hour plus to cram into an elevator with many smelly people.) However, what has now become the highlight is getting to hang out with old friends and new. Seeing people I don't normally get to, making connections, talking with FBI agents and NASA scientists, screenwriters and NYT best-selling authors, established pros and scrappy up-and-comers. That's what makes DragonCon badass these days. As I have the last three years, I kicked off DC with a Mai Tai at Trader Vic's. Sweet nectar of the Gods! Here's a fun story. A group of us were going to hang out at Baen Barfly Central. The Barfly suite is a DragonCon tradition, as well as a staple at several other cons. Essentially, some of Baen's awesome fans set up a hangout in their hotel room for Baen fans, authors, and editors to socialize. It's much more low-key and quiet than hanging out at one of the hotel bars. The room was on the sixteenth floor of one of the host hotels. We were waiting on the elevator. And waiting. And waiting. And waiting. Finally, someone (I'm pretty sure it was LJ Hachmeister) got the idea that we should just take the stairs. A handful of folks bowed out, saying they'd hang out at Barfly Central another night. Another handful of folks said they'd climb the stairs. Stupidly, I was in group two. The scene from the end of Ghostbusters is what you should be picturing. Later, when it was time to head out for the night, another person suggested we take the stairs back down. Going down is easier, but not that much easier. All this would have been fine, except when we got back to our hotel that night we were told that some jackass had pulled the fire alarm and the elevators were not working. We were staying on floor 57 and before you get excited, no, this story doesn't end with me climbing 57 flights of stairs. See, the Westin has two elevator banks: one that goes to floors 1-45 and another that goes from floors 46-70. After waiting an hour for the elevators to get reset, only the bank that went up to floor 45 was working. By this point it was almost one a.m. We had a choice: wait until the other elevators were running again or ride up to floor 45 and climb another 12 flights to our room. We chose choice B. Were my legs sore the next day? Readers, what do you think? I would list all the cool folks I got to hang out with but I know that I'd accidentally leave some folks off, so I'll just say that I had a great time with you all! 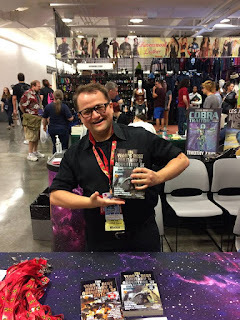 I got to present the Year's Best Military and Adventure Science Fiction Readers' Choice Award once again this year, at The Baen Traveling Roadshow. For this, the third year we've presented the award, Sharon Lee & Steve Miller took home the prize for their short story "Wise Child." Best cosplay: Elvis/Glen Danzig mashup. A guy in a black leather Elvis jumpsuit with devil lock hair. On the back of his cape was the Elvis TCB lightning bolt in rhinestones, only instead of "TCB" it said "138." Nice touch, dude. 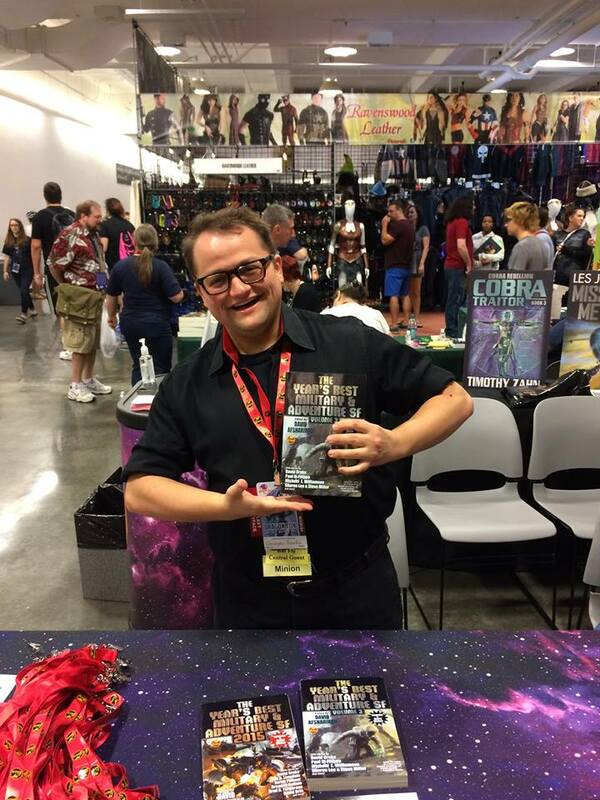 Actually, the best cosplay was Baen Factotum and soon-to-be-published-space-opera-author Christopher Ruocchio as me. (See photo.) This was rather impromptu but I think he pulled it off. His impression of me hocking Year's Best was even more impressive, right down to me forgetting which story was in which volume. Sold a solid number of copies of Year's Best. When I left there were only 3 left on the shelf out of a dozen or more. (I didn't count how many there were to start with). 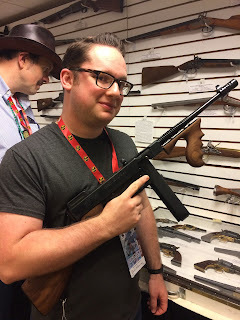 Went to The Armory for the first time. This is two rooms downstairs in the Hyatt that feature edged weapons as well as firearms that are donated (temporarily, of course) to the convention. I'm not super into swords or guns, but this was really cool. (At least for me. Michael Z. Williamson referred to it as "a good start" and looking like the closet in his spare bedroom. Ha!) Highlights included an actual Vietnam-era rocket launcher, several suits of armor, a "Brown Bess" that was longer than I am tall, and a Tommy Gun. Another story: We got back to our hotel rather late Thursday night. We'd eaten a late dinner, but I was pretty hungry. However, I was exhausted and already in the room, so I figured I'd just turn in. Three hours of tossing and turning later, I was starving and had a splitting low-blood-sugar-induced migraine. At this point it was 3:30 in the morning, but I had such a bad headache and was so hungry that I couldn't even feel how tired I was. There was nothing to do but throw on clothes and go in search of something to eat. The hotel bar had long since closed, as had the Starbucks in the lobby and the gift shop. The front desk was still manned and I asked the employee if there was a vending machine anywhere. I was told no, but that there was a 24-hour CVS just down the block. Now, here's the thing about DragonCon: Yes, it's in downtown Atlanta, which can be a rather dangerous place after dark. But it's usually so chockablock full of nerds walking around and Atlanta PD making sure the peace is kept that you never feel unsafe. Let me tell you: Not so much at 3:30 in the morning! The streets were more or less deserted except for a few sketchy folks, including one (presumably) homeless man yelling obscenities to no one in particular and another who got into a screaming match with a young lady he felt was dressed too scantily. (Don't worry, she gave as good as she got and then some.) Luckily, I made it back to the hotel in one piece, but yikes! Moral of the story: Always bring snacks. My degree of separation from John W. Campbell and Isaac Asimov is now as low as it ever will be. I met superfan Ben Yalow, who knew both gentlemen (and many, many other greats of the genre who have since passed away), and he regaled me with stories. It should be said that Mr. Yalow is a great guy in and of himself. One of the great old-school fans, from back when everyone knew everyone if not in person, than in the letters columns of the various magazines. Only Robert Silverberg has attended more WorldCons than Yalow. A very cool dude! I'm sure I'm leaving out a bunch. It was a great time and I look forward to next year. If you get a chance, DragonCon is worth checking out.